Yes the colors REALLY are this vivid! 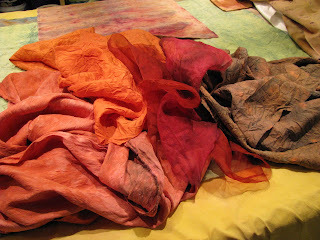 Acquired using Cochineal on silk fabrics. About two weeks ago I found a series of sketchbooks, from the 90's, in my wet studio, much to my chagrin some of my sketchbooks had been ruined when a flower pot had been placed on the top of them. So I've been photographing the contents of each sketchbook, when I came across a set of abstract barn color studies I made in 1999 (I took Color Theory as one of my final undergrad courses). I wanted to make a series of quilts back then but didn't have fabrics that spoke to me that wanted to be barns! 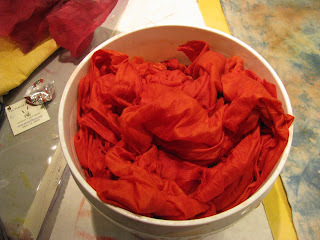 I've been dyeing fabrics the past two days and am now getting much closer to that goal, this is going to be a great series!